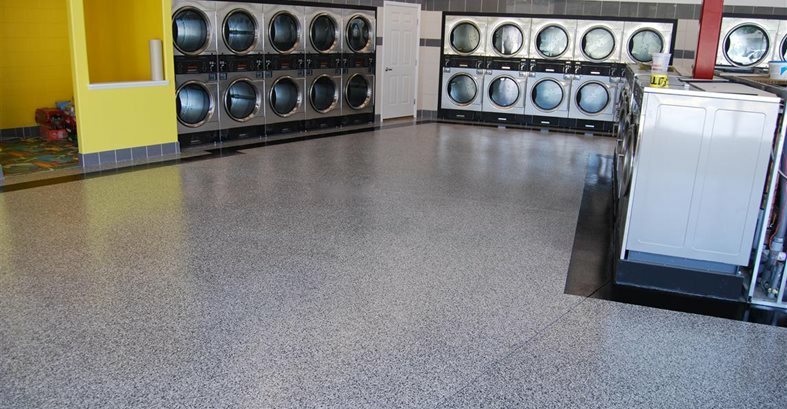 An epoxy coating gives this concrete floor an easy-to-clean durable finish, just what the owner of this busy laundromat was after. Colored flakes in the epoxy coating and a black stripe around the floor perimeter and the machines islands add decorative interest. The stripe was created using a polyurea, which allowed for a fast cure time. Another view of the floor, which is protected by a clear, wear-resistant polyurea topcoat. A view of the floor before the coating was applied. Surface prep involved light diamond grinding to achieve the appropriate profile for a good bond. 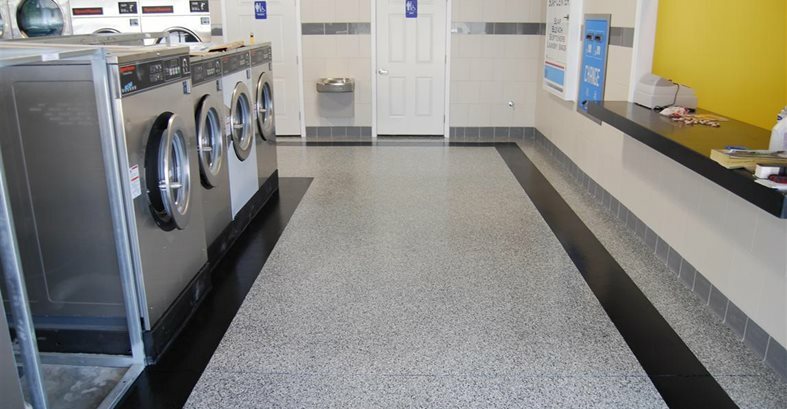 The challengeWhen the opportunity arose for Matthew Owens, founder of Innovative Finishing, Knoxville, Tenn., to install an epoxy floor coating for a laundromat chain, it was new terrain for him. As an installer of decorative and protective coatings for concrete, he had primarily worked with residential flooring up until then. The client encountered Owens at a home builders' expo and was intrigued with the idea of epoxy flooring. He asked if the material could be used commercially, and Owens assured him it could. "Ironically, the client lives in an area of Tennessee that is the ceramic tile capitol of the region," says Owens. "He strongly considered the tile option, but being very familiar with ceramic tile, he did not want to contend with grout lines that would need to be sealed and cleaned. He also wanted something that would conceal dirt and light debris on the floor. The ability to spot repair the epoxy coating was also appealing to him." Design goalsThe client wanted the floor to coordinate with the gleaming, stainless steel machines throughout his facility, so he and Owens decided to use a black, white and gray color scheme. A bold, black stripe was added to accent the perimeter of the floor and the machine islands. The entire floor was covered with a clear topcoat, resulting in a high-gloss, durable finish. "The epoxy coating is a great fit for this environment because we are able to create a very low-maintenance and easily cleaned surface that can be customized to fit the client's desire for both smoothness and slip resistance. We are also able to offer virtually limitless color options and custom characteristics to match the design schemes for commercial spaces," says Owens. Secrets to successOwens and his crew used the Roll on Rock epoxy system from Versatile Building Products to coat the 3,000-square-foot floor. It consists of a base epoxy coat that is hand broadcast with colored vinyl flakes. For this project, Owens used a blend of white, black and gray flakes, broadcast onto a light-gray epoxy base. After light sanding of the floor, the clear polyurea topcoat was applied. A 30-grit silica sand was added to the final clear coat to make the surface slip-resistant. The crew completed the entire job in four days. To minimize surface prep, Owens worked with the client very early in the construction process, before the floor was poured, to recommend certain finishing details that would help keep down the prep costs for the coating, such as instructing the concrete finishers not to burnish the surface at the time of the initial pour. "The condition of the existing slab is definitely a significant factor in the cost of a project. Even on new concrete, a light diamond grind is performed to prep the surface with the appropriate profile as well as allow for a very clean surface," says Owens. One job leads to many othersAs a result of this project and the referrals from satisfied customers, Owens and his team have seen an influx of commercial work. 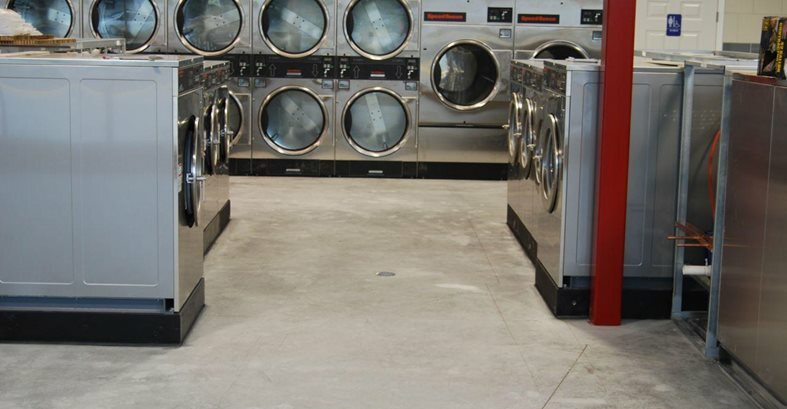 Since then, they have installed epoxy floor coatings for eight additional laundromats over the past three years, sometimes completing jobs in as little as two to three days. For a company that started out primarily offering storage and organization systems, that's quite an accomplishment. "As I would install these systems in spaces such as basements and garages, my clients would ask, 'Now what am I going to do with this ugly concrete floor?' Seeing an opportunity to expand, I began to offer a variety of decorative concrete flooring solutions, including stained concrete, stamped concrete and overlays, spray-on coatings, and various types of concrete repair. However, epoxy coatings, still prove to be among our most popular offerings," says Owens. Innovative Finishing LLC, Knoxville, Tenn.